Airborne Industries’ Aerostat Surveillance system has proved successful in an exercise within Saudi Arabia to monitor border security. 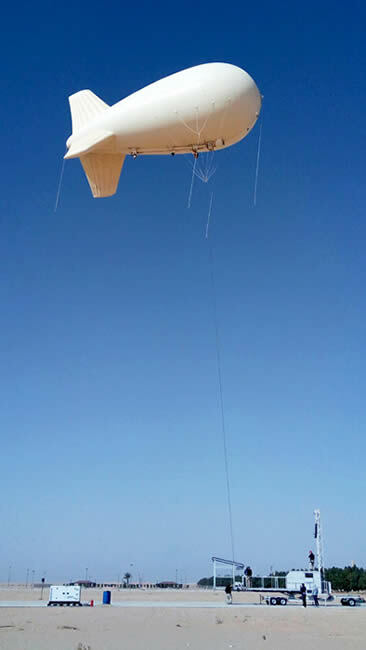 Airborne Industries was selected as the Aerostat provider for the trial by the Saudi Research Institute PSATRI. The trial was a proof of concept exercise for an Aerostat to carry a combined payload for border surveillance and force protection applications. The exercise was organised by PSATRI in order for them to trial their integration software for multiple payloads. The system used in the trial comprised Airborne Industries’ 850 Aerostat carrying a Wescam MX15 camera with laser illumination and target designation, a Blighter radar system and a CRFS - RF eye electronic surveillance system. For this trial the Aerostat was flown at an altitude of 1000 ft and the visual, motion and electronic signatures of the payloads carried were shown to be capable of picking up data at 30 kms. The system, can, however, be configured to be flown at 4000 ft, giving greater range. All the systems can loiter for about one week. Airborne Industries is currently developing a strategic range of rapidly deployable systems able to carry military cameras for a range of applications such as Force Protection, Border Surveillance, Critical National Infrastructure and Large Event Surveillance. The company’s capabilities will be demonstrated at CIPRE in The Hague in May.